During the San Fermin fiestas, it is traditional to wear the typical Pamplonica costume, comprising a white shirt or T-shirt, white skirt or trousers, and the red sash and red kerchief of the fiestas. During the festivities almost everyone wears the so-called fiestas "uniform", to create truly eye-catching images in red and white. It is not known precisely why this attire was adopted, or who thought it up, however it is true to say that it is a way of integrating everyone into the fiestas. The very simplicity of this costume has led locals and tourists alike to adopt it, to form a human sea of red and white, the two colours which are characteristic of the fiestas of San Fermin. As already mentioned, the origins of the present-day Pamplonica attire are not very clear. Several theories attempt to explain this popular, custom which has gradually become widespread. Specifically, some point to the members of the La Veleta Peña (San Fermin social club) as its creators. This Peña was founded in 1931 and the majority of its members were humble, working class people. Wanting a kind of uniform to identify its members and distinguish it from other associations, the Peña opted for white garments which could be readily acquired and were also easily affordable, whilst being a colour that stands out and makes the attire easily distinguishable, and even more so with the red items. This is probably why the costume became more and more popular until it spread to the rest of the fiesta. 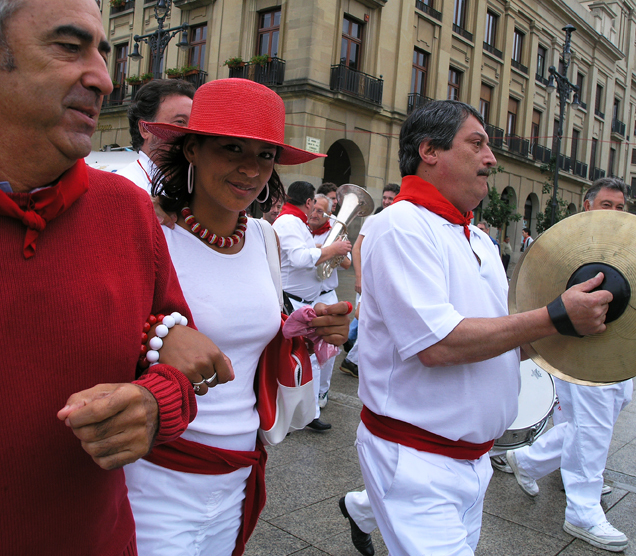 However, others claim that the costume is related to the clothing worn by the Txistularis (Basque flute players) from Biarritz, although these people wear a red beret, and to the Jota singers performing in the Gayarre theatre back in the thirties, or to the garments worn by the jai alai players. All in all, from approximately the nineteen sixties onwards, the costume was adopted by all those participating in the festivities. Of particular importance is the red kerchief, the symbol of the Pamplona fiestas. It is an essential item if you want to fully integrate into the San Fermin atmosphere. Tradition requires you to knot the kerchief around your neck moments after the rocket has been fired to mark the start of the fiestas. It is then not unknotted until the "Pobre de mi" (poor old me) concluding ceremony. With regard to its significance and symbolism, there is no agreement on the matter and several explanations co-exist. Tradition points to the red colour of the kerchief being a symbol of the martyrdom of St Fermin, who was decapitated in the city of Amiens during the persecutions in the 3rd century. The red symbolises the Saint's blood, although others indicate the similarity with the Navarre flag. However, other Peñas are distinguished by the colour of their kerchief - the Peña la Única has a green-coloured one and the La Jarana Peña and the Txako Peña have blue ones. Many kerchiefs have the figure of San Fermin embroidered in one corner, whilst others have the coat of arms of the Peña, society or group to which they belong, or simply the coat of arms of Navarre or Pamplona. The sash wrapped around the waist is also red. It almost always has fringes on the ends. In addition to Pamplona, in central and southern Navarre the Pamplonica attire is also the typical fiestas costume. To complete the San Fermin attire, tradition dictates that white espadrilles should be worn, with red ribbons tied around the leg. However, this custom is gradually being dropped in favour of trainers or more comfortable footwear. Finally, for cooler days, a red jacket or other item of clothing is generally worn.